This chapter explains why neuroimaging raises constitutional puzzles, even where constitutional rules at first seem clear. The Fifth Amendment bars compelled self-incrimination and one might assume that would prevent police from circumventing this limit by obtaining evidence of mental states some other way. 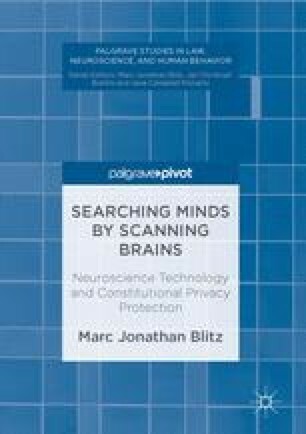 The Fourth Amendment would almost certain classify neuroimaging as a search, and thus subject it to constitutional limits. However, both of the implications of these provisions are unclear: They seem to leave police with plenty of room to gather physical evidence of various kinds – and there are certain respects in which neuroimaging evidence resembles such physical evidence (as the chapter illustrates with the help of a hypothetical crime investigation). The chapter points to a way ahead and also argues that while the First Amendment isn’t generally considered a kind of privacy protection, its freedom of thought protection may be a key part of solving these puzzles. Carter, R. (2015, September 25). Neurotelepathy: The Rise of Mind-Reading Machines, Science Focus. http://www.sciencefocus.com/feature/mind-reading/neurotelepathy-rise-mind-reading-machines. PBS NewsHour. (2016, June 28). Solicitor General Donald Verrilli, Who Beat Back Legal Challenges to Obamacare, Steps Down. http://www.pbs.org/newshour/bb/solicitor-general-donald-verrilli-who-beat-back-legal-challenges-to-obamacare-steps-down/.